Jumbo-sized 3 foot diameter inflatable globe is great for play and learning. The Astro-View Globe is made with NASA satellite imagery, showing the world we live in with beautiful detail. Clouds, mountains, oceans and deserts are all depicted in stunning clarity. 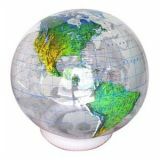 This durable, beautiful globe can be played with or hung up from the ceiling for an eye-catching display. It's a great way for young explorers to learn more about the world! 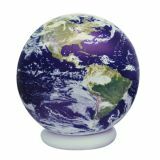 Jumbo-sized 3 foot diameter inflatable globe is great for play and learning. Durable and geographically accurate for aspiring young geographers! Made of clear, heavy-duty material with lots of great topographical detail.